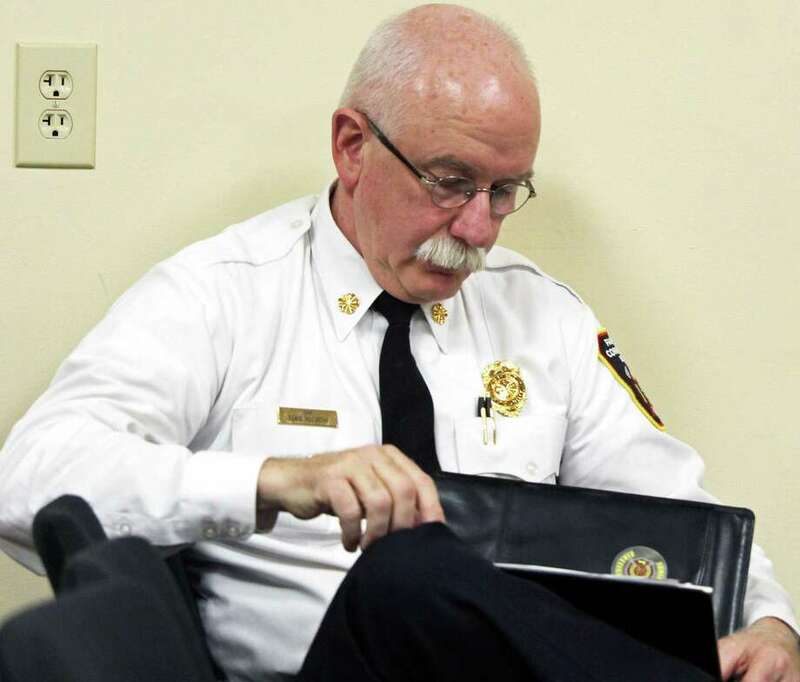 Fire Chief Denis McCarthy reviews his department's non-recurring capital projects prior to the start of Wednesday's Board of Selectmen meeting. FAIRFIELD — The Board of Selectmen Wednesday began a review of nonrecurring capital items for the town that includes a new elevator, a tide gate replacement and a rebuilt 16th hole at H. Smith Richardson Golf Course. No votes were taken on the projects, which total up to about $1.2 million. First Selectman Mike Tetreau said the board would vote after it also reviews a list of similar projects from the Board of Education. Funding for any approved projects would be provided through bonding. Among the proposed items is a new elevator for the Fairfield Woods Branch Library, at an estimated $325,000. Public Works Director Joseph Michelangelo said an elevator at the branch was added when the library was enlarged in 1990. “It was a great idea, but it doesn’t meet today’s standards,” Michelangelo said. Just to get into the elevator, he said, a person has to manually open two doors and a gate. The new elevator would meet federal Americans with Disabilities Act requirements and be a bit larger, which will require reconfiguring and taking some space from a storage room and a conference room. Tetreau said he’s had the use of the elevator demonstrated for him and agreed it is not user-friendly. The Recreation Department is seeking $100,000 to rebuild the tee box and green at the 16th hole at Smith Richardson. “This is part of our 10-year plan,” Recreation Director Anthony Calabrese said. The plan was put in place to spend about $1 million in upgrades on the course, but spread out over 10 years, rather than all at once, Tetreau said. This is separate from a project underway to rebuild the course clubhouse. Fire Chief Denis McCarthy told the board his department is looking for $120,000 to replace two floor jacks in use at the Jennings Road station and $106,000 to replace the command vehicle. McCarthy said the floor jacks, used by the department’s mechanics to work on the apparatus, were given to them in 1994 from the Public Works Department. The command vehicle they seek to replace is used each day by the shift commander, and by the time a new truck is received, the current one will have 100,000 miles on it. The current vehicle will then be used as a reserve vehicle. The Conservation Department is looking for $225,000 to do design, geotechnical work and modeling work for a new tide gate and dike in Pine Creek, north of the football and softball fields on Old Dam Road. On the list, but not discussed at the Jan. 17 meeting because the department head could not attend, is the relocation of the town’s computer data center. The town’s data center is in three different spots. The department is asking for $250,000 to combine the data center into one location.